A document in Sketchpad contains one or more sketches—that is, one or more collections of related mathematical objects. To create these objects, you’ll use Sketchpad’s Toolbox and menus. A document appears on your screen in a document window, and can be saved to your computer’s hard drive or to your network. Once saved, the document can later be reopened from the same place. When a document contains more than a single sketch, each individual sketch appears on its own page. •Click a page tab at the bottom left of the window. •Press the Page Down key or the Page Up key on your keyboard. •Press a Link action button that links to a different page. •Open the Document Options dialog box and double-click a page in the list of pages. A document can also contain any number of custom tools, which extend the functionality of the fundamental Point, Compass, Straightedge, and Polygon tools in the Toolbox. Use File | Document Options or choose Tool Options from the Custom Tools menu to manage the pages and tools contained in a Sketchpad document. A new Sketchpad document always begins with a single page or sketch — a view of the geometric plane. Over time, you may want to add additional pages to a document. For example, you may want to organize a series of sketches that develop an argument; you may want to present an activity that has several parts; or you may want to explore a conjecture in more depth than would be possible in a single sketch. In each of these cases, it’s convenient to store several sketches together as pages of the same document. 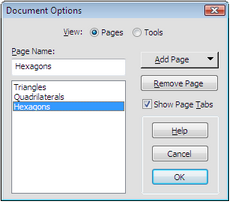 To add pages to a document — and to name, copy, reorder, or remove existing pages — choose File | Document Options. When a document has more than one page, page tabs normally appear at the bottom left of the document window, and a page name or number appears in the window’s title bar. To switch from one page of your document to another, click a page tab or press the Page Up or Page Down key on your keyboard. You can also create Link buttons to jump between pages. Use File | Document Options to hide or show the page tabs. In addition to multiple pages, a Sketchpad document may contain one or more custom tools — tools that you or someone else has created. Custom tools extend the functionality of Sketchpad’s fundamental tools to provide new mathematical objects or to provide new ways to construct familiar mathematical objects. 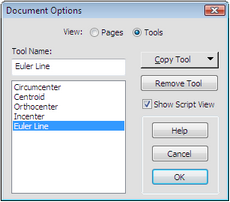 When you create a new custom tool, it becomes part of your document. Use File | Document Options to rename, reorder and remove custom tools from the active document, and to copy tools from a different open document into the active document. Organize custom tools you use frequently by storing each collection of related tools in its own document. If you use a document’s pages to describe the tools it contains — and give examples of their use — your document becomes a handy “toolkit” that you can share with other people. For example, you might want to make a kit of tools for constructing different centers of a triangle or one for constructing various regular polygons. When you’re working in a sketch, you can use not only the custom tools located in the document on which you’re working, but also any custom tools contained in other open documents. To work with custom tools contained in a document on your hard drive, open the document so its custom tools become available. Alternatively, if you store any documents in the Tool Folder, tools from these documents are available whenever you start Sketchpad — even if the documents that contain them are not open. View the details of a tool in written form using the Script View. This view shows you a list of each given object and each constructed object of the tool, allows you to modify the tool in various ways, and allows you to watch the tool step by step as it operates. Use the Show Script View command in the Custom Tools menu, or the Show Script View checkbox in the Tool Options dialog box, to see the Script View of the active custom tool.